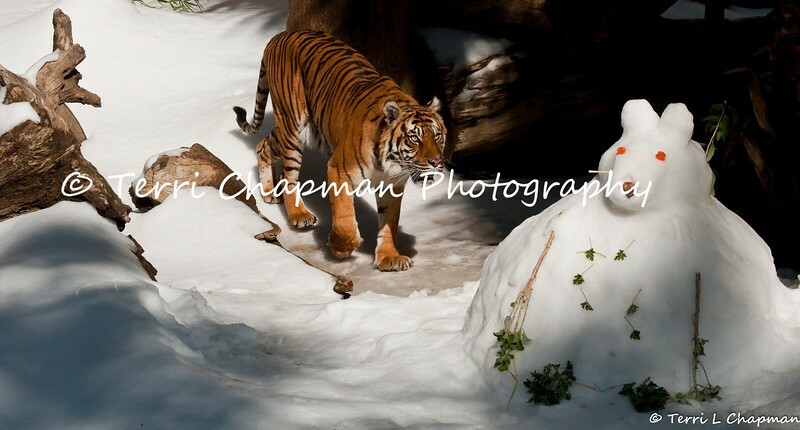 This image is of a female Sumatran Tiger enjoying Snow Day at the Los Angeles Zoo and Botanical Gardens. Each year the zoo hires The Union Ice Company to come in and blanket certain animal exhibits with fresh snow as part of the zoo's enrichment program. The Animal Keepers enjoy building edible snowmen for the tigers and American Black bear and in this image the tiger is ready to explore the snow mouse that features pieces of fresh meat and vegetables. Sumatran tigers are found only on the Indonesian island of Sumatra and are listed as Endangered by the International Union for Conservation of Nature (IUCN) for there are less than 500 tigers remaining in the wild. Continued agricultural habitat destruction, poaching, and killing of tigers that come into contact with villagers, all intensify the crises surrounding tigers.